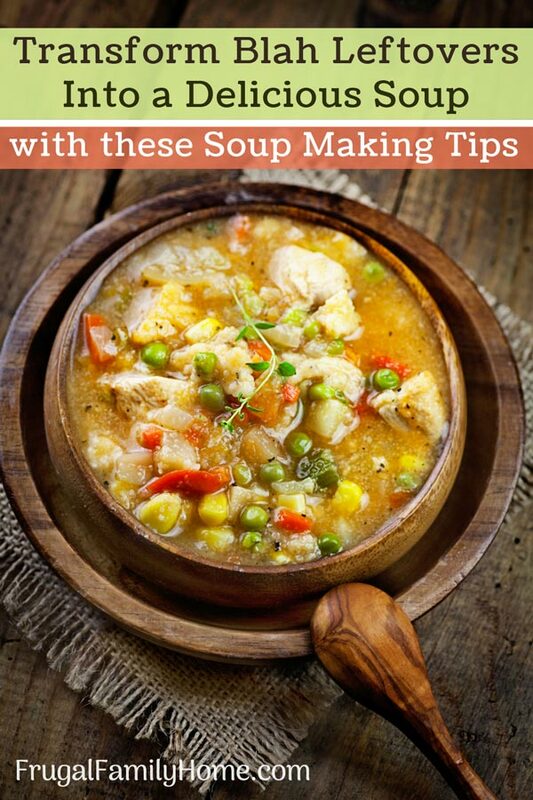 Soup is a great frugal dish to make. While it’s great to have a recipe to use, often soup can be made with leftovers, simply and easily too. Here’s how to make soup from scratch with what you have on hand. 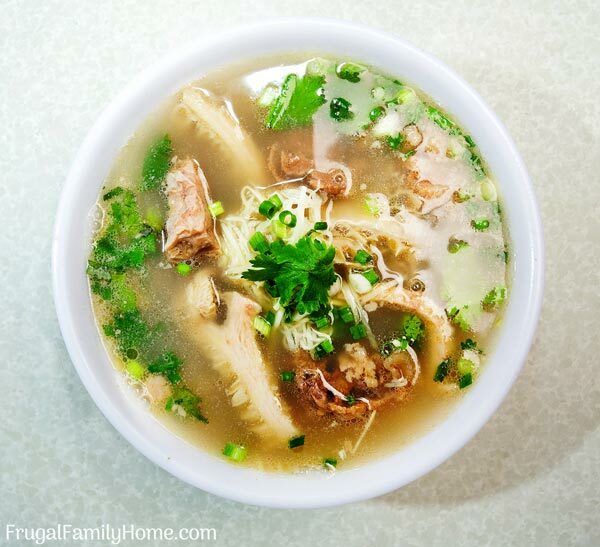 There is something about a yummy warm bowl of soup that hits the spot during the cold winter months. I try to make soup often in the fall and winter. 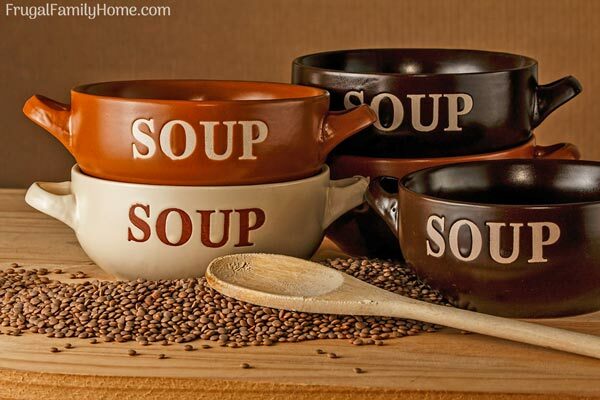 We have our favorites like creamy homemade potato soup, easy and frugal hamburger soup or split pea soup. But I’ve made soup from leftovers many times too. If your family doesn’t like leftover much, like mine, then making a new meal of soup out of the leftovers might be the perfect solution for you. A long time ago I shared a soup I made from leftover steak, baked potatoes, and roasted vegetables. I added a batch of cheese sauce, frozen broccoli, a little onion, and chicken broth. And it turned out to be a soup my family raved about. You can read the full post but I have to warn you the photos and writing aren’t that great because I wrote it a long time ago but the soup delicious. From that time on I’ve experimented with making soup from leftovers. When you can use your leftovers for another meal, it feels like getting free food and you don’t have to worry about the food going to waste. After all wasting food is like throwing money away, and who wants to do that? Some of the links in this post are my referral link. 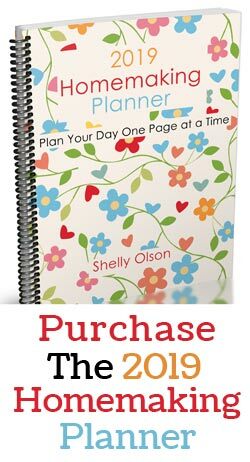 When you purchase through them I can make a little money at no extra cost to you. See my disclosure page for more information. Making soup from leftovers isn’t an exact science. But it is helpful to have a set of guidelines to follow. It’s good to have a mix of leftover meat and vegetables from your meal. And maybe a few baked potatoes or noodles. You can make any leftovers work except maybe bread items, like casseroles that are covered in potato chips or bread crumbs as those could get soggy in the soup. Now you have your leftovers, you need to think about what will be the soup base. There are quite a few options for your soup base. You could use something like a batch of cream of “something” soup, cheese sauce, gravy if you have it, broth of some kind, or even just water. I make broth from scratch but when I don’t have any on hand; I like to use Better than Bouillon for broth. It’s a paste made with vegetables or vegetables and meat. It’s less salty than regular bouillon cubes but is like bone broth. Sometimes you have meat leftover and other times you won’t. You can opt to make a vegetable soup when you don’t have any meat on hand like a broccoli and potato cheese soup. But if your family really likes to have meat in their soup, you could use a can of tuna, chicken, or if you have precooked chicken in the freezer you could use that. One way to always have a little meat in the freezer for leftover soup is to save it up. When you have a half piece of meat that no one wants. Put it into a freezer bag or container, be sure to cut it up into bite-sized pieces first. You can add many kinds to your bag. When you need a little leftover meat for soup, you have it ready and waiting. If you have a little meat leftover, you can add a can of beans to the soup to help make it more hearty. I’d drain the beans first and then stir them in. Most varieties of beans will work but some favorites are great northern, a white bean. Black beans, but these can darken the soup. Kidney beans are the go-to bean for leftover soup or from scratch soups. You could even use pinto beans if you are making a Spanish type soup. Even if I have vegetables leftover, I like to add a few more to bump up the nutrition and you might too. Can’t ever have too many vegetables, can you? You can add fresh vegetables to your soup. If you are adding fresh, I’d suggest cooking them in butter or oil before adding the other ingredients, since the other ingredients will already be cooked. You can do this by adding a little butter, oil, or even bacon grease to the stockpot. Then after the pan is warm and oil or butter is melted. Add the vegetables and saute until they are slightly softened. 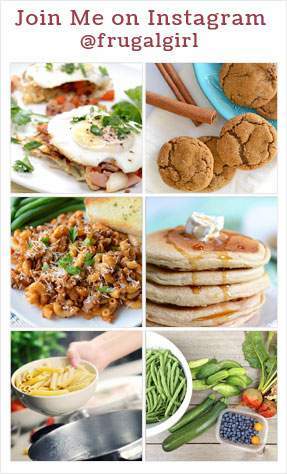 You can also use frozen vegetables like broccoli, or broccoli and cauliflower mix. Or even the diced vegetable mix you can get in the frozen food section. With frozen vegetables, you shouldn’t need to cook them first. You can add them to the soup and let them cook with the other ingredients. Canned vegetables are another alternative for adding to your leftover soup. You can put in a can of mixed vegetables, green beans, corn or whatever you have on hand. By using up the vegetables you have leftover and mixing them with another type of vegetable you can really make a delicious soup that doesn’t feel like you’re eating the same old thing again for a second night. If you don’t like a thin broth-like soup, you can thicken it up with leftover mashed potatoes or mashed sweet potatoes add these to the broth or water. They can give the illusion of more of a creamy soup. If you add a little cream or milk to the soup, it will taste even creamier. Just be careful to add the milk or cream in the last bit of cooking. If the milk boils, it can break the soup, which means it will get clumpy and yucky. I’ve had it happen before so it’s best to add milk or cream at the end of the cooking time and turn the soup down so it doesn’t boil to avoid this. If you like a pureed soup, you can cook the soup and right before serving use an immersion blender to make the soup smooth. If your leftover soup has beans in your soup, you can use an immersion blender to blend part of the soup to thicken it too. It all depends on what your family likes. If you are adding precooked noodles or rice to your leftover soup concoction, I’d suggest adding these at the end of the cooking time just long enough to reheat them in the soup. Noodles swell in the soup when they are precooked and absorb all the broth if they sit too long in the soup. Making more of a pasta dish instead of a soup. The cooked rice can fall apart in the soup if cooked too long. If adding uncooked rice to the soup you can add it during the last 20 minutes for white rice and the last hour of cooking for brown rice and it should cook just fine in the soup. If you are using fresh noodles to add to your soup, you can add them in the last 15 minutes of cooking time. Be sure you have extra broth as the noodles will absorb liquid as they cook. When using leftovers to make soup you want to think about what flavors are in those leftovers. It’s safe to use garlic, onions, celery to pretty much any other leftovers and it should be fine but consider the spices and herbs that are used in your leftover soup. If you are using leftover salsa and taco meat with beans, stick with more Spanish flavors. Something like cumin or chili powder. If you have steak with paprika, onion salt and garlic on the outside, you might not need to add much to bring out the flavors. Maybe a cheese sauce base would be good enough with a little parsley added. 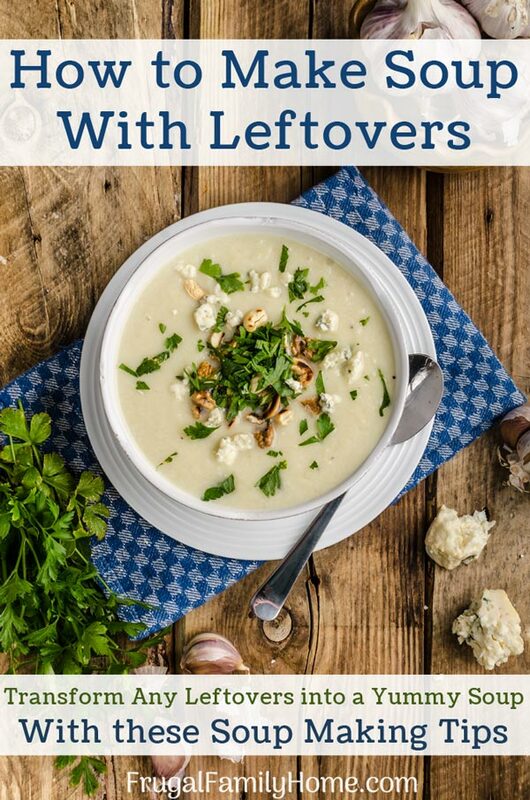 If using leftover chicken and potatoes then thyme, rosemary, and parsley might be a good combination for a creamy or broth-based soup. 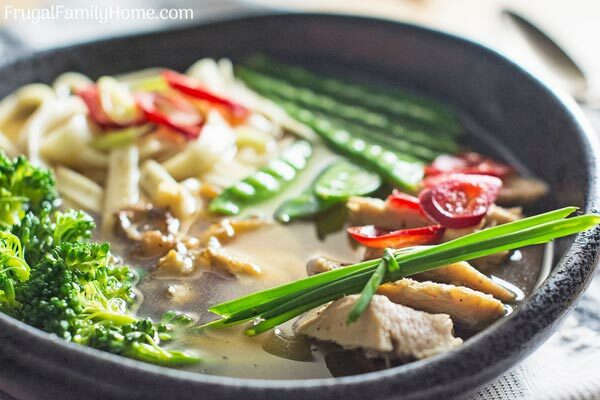 If you have teriyaki meat leftover with a few stir-fry vegetables, it might be good to add green onions and a package of ramen noodles with or without the seasoning package to make a ramen soup. If you stick with flavor combinations that your family already likes you should be good. And maybe you’ll find a new flavor combination you’ll love. The next time you have leftovers you know your family isn’t crazy about eating again why not try to make a delicious soup? Use these guidelines to help you craft a new soup that your family will rave about. Be sure to write what you use and what leftovers worked best so you can recreate it again if it’s a winner with your family. What do you normally do with your leftovers? Do you ever make soup? If you come up with a great combination for soup, I’d love to hear about it. Very helpful Shelly, thank you!!! Love this idea for using up leftovers! I throw away so much produce because we don’t eat it all during the week, but it’s not enough to serve again for a meal. Putting it all together in a soup would be a good solution for me.